I wanted to see if we could commence a running Cruise Director and Activities Manager list here on the Royal Caribbean Blog Boards. As many of you know, the Cruise Director can be very influential in providing a fun and interactive experience while on a cruise and for this reason the question is often asked "who will be the cruise director on my sailing?" However, as with any position of importance, the Cruise Director also enlists the assistance of his or her Activities Manager to host a number of events throughout a sailing (e.g. trivia, bingo, karaoke, etc...). Therefore, I would also like to keep the list updated with the current Activities Managers whom many of us develop strong relationships with based on our varying degrees of participation in ship events. While I know there are similar lists maintained elsewhere on the internet, my desire is to provide an easily accessed (thanks in part to the long-term edit function of these boards) and more user friendly document than what currently exists. In addition to receiving regular updates from the fantastic blog community that fill these boards with Royal Caribbean knowledge everyday, I also hope to leverage Kat's evergrowing Periscope community to obtain real time and accurate updates as to who holds these very important positions throughout the Royal Caribbean fleet. Below is my first stab at a draft of the list based on information I was able to retrieve from various social media and online content. As you can see, there are some blanks, which I am sure many of you will be able to assist with filling in. Please feel free to respond here with any list updates or any comments as to the format or layout of the document. I would like to thank all of you in advance for any assistance you can provide with making this list a useful resource for Royal Caribbean cruisers. You are a brave soul for taking this on. Thank you!! This is FABULOUS!!!! Thank You very Much Rick, for taking this on!!! This is very good Contribution, and Bentifical to the RC Blog Family!!!!!! Thanks, Matt. Going to do my best. 25 ships and only 4 more on order...should be cake. Awesome.....lets hope we can keep this current!....great idea! Elvis Pinto was (I think) Activities Director on my Vision cruise this past spring. He was a blast! Very entertaining, and I saw him everywhere on the ship. 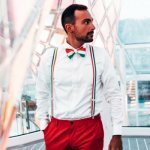 I'm not surprised he's now a Cruise Director! Pretty cool list you have here.....we had Ricky Mathews on our last cruise. He was great. Looks like I'm going to have Jeff Arpin on my next cruise on Liberty. I'll have to see if he looks familiar as I don't recall him on past cruises. LOVE that you're doing this... great quick reference. Thanks! I asked the very lovely Angelle Rutten van Hemert, activities director on Empress. She said this was the last cruise for Carlos Torres as CD, and Elvis Pinto will be the permanent Cruise Director going forward. In addition Angelle's contract ends Oct 1. Thank you very much, Ken! Any intel on Angelle's replacement? She said CeCe, Cecilia .... Blah Blah Blah, I couldn't remember the last name by the time I got a chance to write it down. Michael P should be able to get that info soon when he sails Empress. Yes, Cecy del Razo. Thanks for the confirmation. Super cool list, thanks for taking the time. I was noticing there isn't many women as cruise directors, then I notice most activities managers are women. I guess its either by design or it just worked out that way. Interesting news regarding Harmony's Caribbean season. List updated accordingly. Liberty of the Seas 12/26/16 -- Anyone know who the cruise director will be? Hi - I just returned today from Anthem 7 nights from Bayonne to Bahamas. 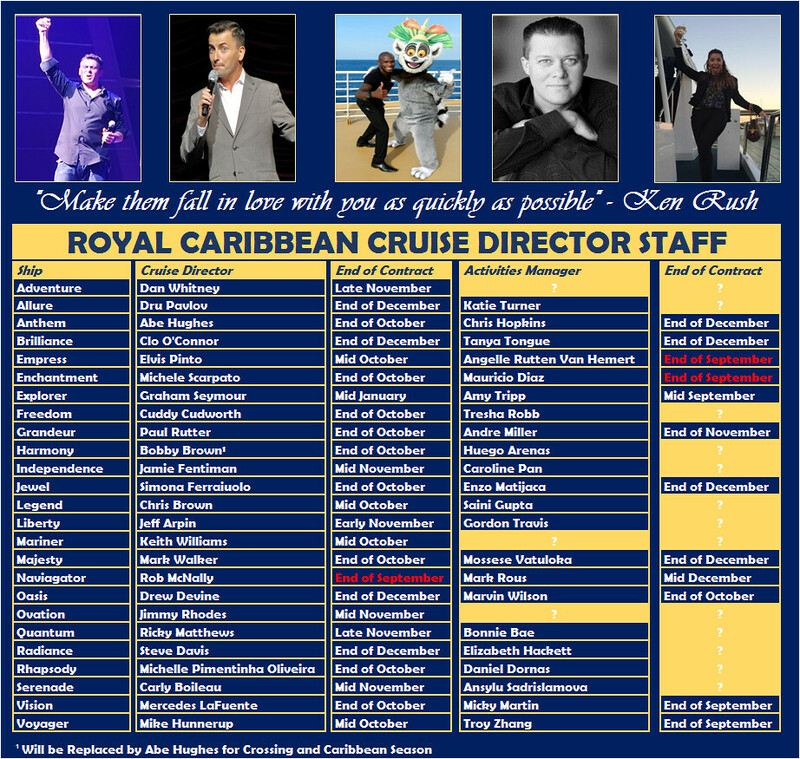 Dru Pavlov is now the cruise director. Chris is still activities manager. They seemed to work well together. I will post all of the cruise compasses as well. Does anyone know who the current CD is on the Allure? I just got off of the Enchantment OTS and the cruise director was Michelle Oliveira from the USA but now resides in Brazil.